I know many of us struggle to get things done at this time of year. When we have to work right up a few days before Christmas, things can feel hectic. That’s why I like to step back and think about some of the things I love about Christmas time. Being a working parent means getting everything done on the weekends. (Or after the kids are in bed.) And somehow it seems I’ve managed that this year. I always marvel when life seems to actually work out, despite my natural disorganization! 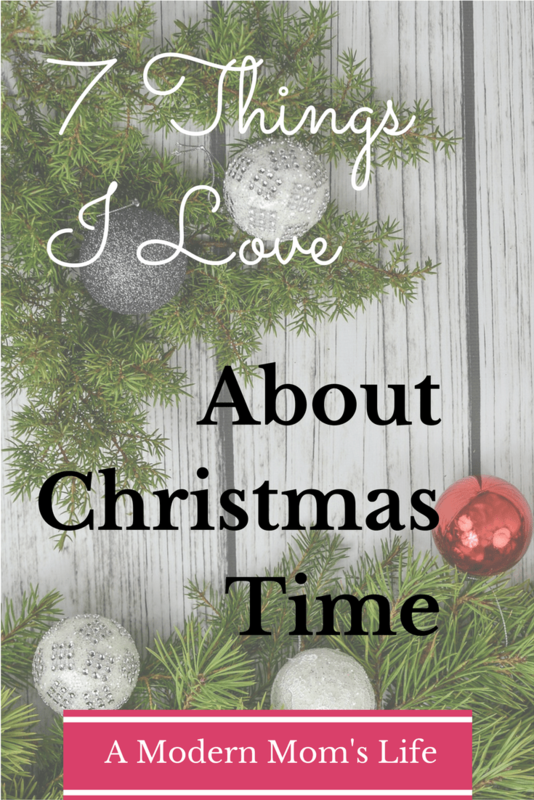 Now that the big day is getting near, I wanted to share seven things I really love about Christmas time. Do I really need to say more? From the beginning of December until well into the new year, my caloric intakes goes up. This year I am trying to be more mindful of how much I’m eating, but I know I’ll still over indulge. And, at my workplace, our customers bring in boxes of chocolates or cookies because they love us so much. It’s very, very sweet – and speaks highly of my boss – but sometimes we’ll have 2 tins of cookies, a box of chocolates, and some other homemade treats all on the go at the same time! My willpower is shot at work most of the time, but I do better at home. Smaller plates, and more vegetables help me from eating way too much. Some people find gift wrapping tedious (my husband) but I quite enjoy it. This year I spent 5 episodes of Game of Thrones wrapping presents in one afternoon. And I wasn’t even finished afterward! But I love the beauty of a well wrapped gift. Square(ish) corners, a nice bow or ribbon, and a sweet gift tag all combine to make an elegant parcel. Though sometimes I wonder why I waste my time when it’s all ripped off in about 5 seconds once the kids get their hands on their gifts! While I’m not one to gussy up the house much at Christmas time, I do love seeing all the decor everywhere I go. When I was a kid we would take family drives around the neighbourhoods to look at all the Christmas lights. We haven’t made a lot of effort with our own kids to do that – though we have taken the long way home when we see some in the distance. Related: 5 Easy Holiday Traditions to Start with your Family Right Now! When you’re a child yourself, you don’t fully understand much about the Christmas season. I mean yes, you get the gift-giving, family gathering, eating junk food, and being off school stuff, but you don’t see the wonder of the season from the other side. Now that I am a parent Christmas time is more special. The girls have an unfailing belief in Santa, Elfie Sparkle (our Elf on the Shelf) and every other magical aspect of this time of year. I love feeding into it: “Did you find Elfie this morning?”; watching Christmas films and specials; baking treats and wrapping gifts together. Seeing the surprise and wonder on their faces on Christmas morning is the number one thing I love about Christmas time. I know a lot of people gripe about families. And sometimes I do too. But really, there’s nothing better than getting together and relaxing with family and friends. Whether you have a big family, or small, holiday traditions are special. I have both – a really large side of our family (my husband’s side) and an intimate side of my own. Both have advantages and disadvantages. But, both are also fun, loving, and unique. And they are often the people you can be “yourself” with the most. Whether you bake (or buy) some cookies and share them with your neighbours, family and friends, or volunteer your time at a charity or soup kitchen, giving is the real spirit of the season. I love surprising people with something sweet and thoughtful at Christmas time. Often the smallest gestures get the most reward for the giver. When you give the perfect thing – whether it’s something you’ve hand made, a big, extravagant gift, or your time – it really warms your soul. Or, at least it does for me! What do you love about Christmas? Is there a fun tradition or something else you do as a family that warms your heart? I want to hear about it! Share with me in the comments. PS – If you aren’t on my email list, you’re going to miss out on my annual Christmas card. Be sure to sign up – you’ll get an email a few times a month with updates of what’s going on with me and the family, and what’s new on the blog. We are hoping to get out tonight to take in some lights. I hope you have a great first Christmas with your little one. The wonder of the kids is so amazing to watch! Families can be fun, but also too busy and stressful. We have 2 completely different family celebrations. My side is small and quiet, just my parents, myself and my sister (and our families) while my hubby has 4 sisters and they all have spouses and all but one has 2 or 3 children. Now some of those children are grown and bringing their current partners with them and it’s major chaos. But it’s still fun! The build-up to Christmas is quite something – especially with children. Thanks for sharing what you love Eva! Hi Jess, quality family downtime and eating are what I enjoy this time of year. I do like a nicely wrapped present, so although I find the task tedious I do make the effort to make gifts look nice. Luckily I don’t enjoy a drink so all my calories come from food! Thank you for linking up with #MMBC. Christmas is definitely so much more magical when you have kids. I love seeing their faces on Christmas morning. They always bring their stockings into our room and open them up on the bed before we head downstairs to see what the big man left down there. And yes, all the chocolate! The kids really do “make” Christmas. No one is as excited about it as young kids. This year was no exception for us! It really is a lovely time of year. And having your own family does make it more special! Thanks for the comment Helen. I’m hearing a lot of people don’t enjoy wrapping! For me it’s a love/hate thing. I like the beautifully wrapped presents, but sometimes it’s majorly tedious! The weather went bad on us before we got to take a drive and see all the lights this year. But we still saw a lot around our own neighbourhood! Kids and magic go hand-in-hand. I hope your family enjoyed their holidays this year Pat! Don’t we all eat too much over the holidays? I know I do! 😉 Happy to be a part of your linky Su!